“The Last Supper of Jesus” by Andre Derain. Courtesy Wikiart. PEACE’s Maundy Thursday service is at 7 p.m. Thursday, April 13. 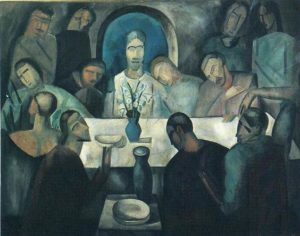 Celebration of the Last Supper — Also called Maundy Thursday and Holy Thursday. Our evening service will celebrate Jesus’ command to his followers to “love one another.” Holy Communion also will be celebrated. At PEACE, we welcome all who hunger for love — especially the perfect, never-changing, never-ending love God lavishes on everyone who looks for Him. Our 7 p.m. Maundy Thursday service lasts a little over one hour. This is the day we remember how Jesus instituted our sacrament of Holy Communion. At PEACE, we continue with the Holy Week theme of following Jesus along his path toward sacrifice, when he opens his arms to all people. We enter this most solemn conclusion to our season of Lent, knowing Jesus’ path leads to his painful and humiliating execution on a cross. But we also wait expectantly, like a caterpillar in its cocoon, trusting in God that we will rejoice in new life come Easter Sunday. Holy Communion — During our Maundy Thursday service (and every Sunday morning), we celebrate at the altar with wine and bread (usually in the form of thin wafers). We also have gluten-free wafers — just ask when you get to the altar. Grape juice also is available: We use a split chalice, with wine in the larger side of the cup and grape juice in the smaller side. You’ll dip your wafer into the side of your choice. Washing of Feet — In addition, we remember Jesus’ vocation as a humble servant. Before starting his Last Supper with his closest friends, Jesus took a basin of water and a towel, and he washed their feet. In those days, road had no pavement and people wore sandals. So dust covered people’s tired feet. By washing the dirt and grime from his followers’ feet, Jesus showed the level of service he wants us to render each other. To remember that model, two Peace staff members will offer foot-washing at the front of the Sanctuary for anyone who wants to participate. You’ll sit on a chair, remove your shoes, and a a church “servant” will lightly wipe your feet with warm water and then dry them off. “Maundy” is an old word that comes from the Latin verb “mandare,” which means “to command.” During Jesus’ Last Supper with his followers, before he was arrested and eventually crucified, Jesus commanded his friends to “love one another” in the same way Jesus had loved them. He told them that this love is a reflection of God’s love for them — and for all people. The point of all this? “So that the whole world may know” that Jesus came from God with a life-renewing message of love for all people. We invite you to come at 6:15 p.m. every Thursday during the season of Lent, including Maundy Thursday. We’ll enjoy a simple dinner of soup and French bread. Our 7 p.m. evening Lenten prayer service lasts just 30 minutes. Click here to learn more about Holy Week and Easter. Click here to learn more about PEACE Lutheran Church.